- Create a new event for a thought. - Enter the date shown (2019-04-01). The cursor jumps into the 'to' field as it should. - But the date shown automaticallly, is one day BEFORE the start date. @rengel, 100% repro for me also ... have you created a ticket for the team? If not, please see Shelley's "Please Read" Post. I don't like this kind of 'red tape' (tickets, etc.). IMHO, posts on this forum should suffice to alert the people concerned; after all it's called 'Issues'. It takes time enough to produce all these screenshots. I don't think I've ever met anyone who does @rengel ✂️ ... however, if we have software issues that we'd like resolved, 🏁 getting them to the team via the proper channels that Shelley has provided us seems like the best way to go about reducing future frustration and eliminating the need to repeat ourselves. I was asking you if you had logged the issue as I was considering logging it myself to ensure the team was aware of the issue, but I didn't want to duplicate the noise for the team if you had already done so ... so, have you? 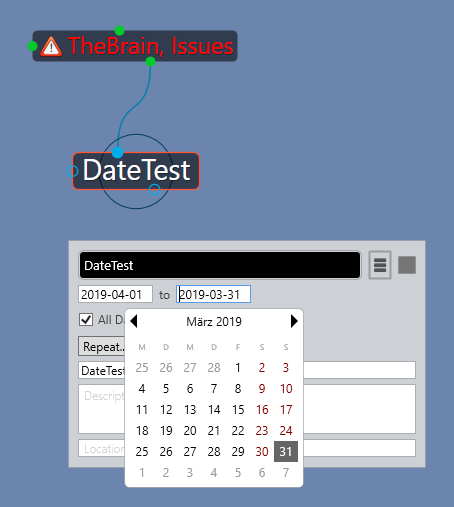 Firing up your mail client, addressing an email to support@thebrain.com, pasting your screenshot, and including the version number and a few basic repro steps is arguably easier than authoring a new post on the forums here ... maybe this is just me? ... but I didn't want to duplicate the noise for the team if you had already done so ... so, have you? And I suppose, the 'team' does follow this forum. And maybe it is just you. If I had done this, you probably might never have learned about this bug. I don't want help (support) with this bug, I want it it to be known. I reported this in September via the support email, if you want to report and reference my request: #64148. I see this interaction and ensuing confusion as to what is or isn't logged as evidence of a sub-optimal support process. Sub-optimal does not mean terrible or broken by the way. It would sure be great to have a publicly searchable issue backlog a la [GitHub example here] ... both for the team, and TB users. Every well documented bug we community members find, screenshot, annotate, and report to the team is free work we're doing for the betterment of the product. Should the QA team have caught many of the bugs we document? ... of course! ... but, obviously a few bugs here and there are to be expected and I'm only half-way complaining here because I appreciate the product quite a bit more than most that I use, so I'm happy to aim towards the better and both pay for the product and gift my QA time to help uncover and resolve the warts within. Thanks everyone for posting. I've confirmed that this issue is documented and still under review by the development team.